“I bring it up to let you know that this is the way I feel right now. This has been one helluva emotional roller coaster for me. Another one after I’ve read Slammed by Colleen Hoover last year. I was happy, hopeful, sad and broken as I read along from start to finish. All the Bright Places by Jennifer Niven have so many negativity in it and each negativity comes to an equivalent positivity. This book is about hope and despair, it’s about living and dying all mixed up into this simple yet beautifully crafted story. I never thought I get hooked… or get emotionally damaged at the same time. It is a story about a girl named Violet who was saved by a teenage nobody called Finch who was compelled by death or the different ways to take his own life. I really want to give you a summary of the story, just like I’m always doing with my previous review, I want to describe how Violet and Finch met, how they end up together, how they became best of friends, how they fell in love, about their marvelous field trip or “wanderings” but I really feel that I won’t give justice to this book. You must read it to experience it all. I like the characters so much, they felt real to me, not just a fictional character. Their feelings, each actions to events… they are real. I can relate to them in all different kinds of way. I understand why Violet slowly fell in love with Finch, his character is so beautiful. He is very smart and witty, they both are, and their chemistry is a blast! He always say the right thing to say, he always know what to do ( when he is with Violet…) He is super funny and perfect gentleman. I think I’ve got a map in my car that wants to be used, and I think there are places we can go that need to be seen. Maybe no one else will ever visit them and appreciate them or take the time to think they’re important, but maybe even the smallest places mean something. And if not, may they can mean something to us. -Finch, All the Bright Places by Jennifer Niven. Aside from the story, I was really captivated how this book contains the most inspiring quotes I ever read. It was truly a life changing experience for me. Your hope lies in accepting your life as it now lies before you, forever change. If you can do that, that peace you seek will follow. – Violet, All the Bright Place by Jennifer Niven. It shatters me into tiny pieces, and for a moment or two an hour or two, I felt what Violet felt in the end. 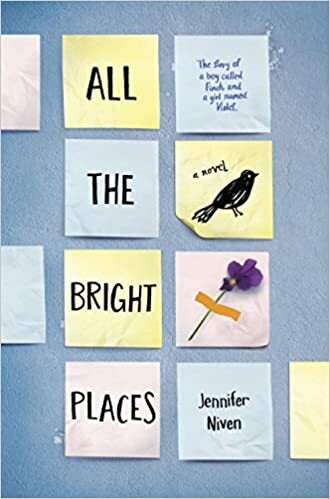 Jennifer Niven started compiling her written works since she was 10 years old but at the year 2000 she decided to take writing as a professional career and never looked back. She is now working on her tenth book and her 9th book will be released on October 4, 2016. Support the author by buying All the Bright Places.